NYCC 2010: Have You Seen This God-Puppy? Be on the lookout for a small, ink-stained puppy with magical powers - he may be wandering around New York. 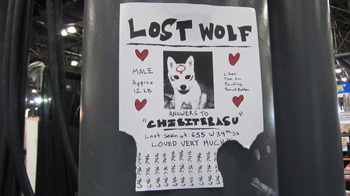 These Lost Puppy posters were all over New York Comic Con - it seems pretty clear that Chibiterasu's owner is very worried about him. If you see the divine pup, be sure to catch him so that they can be reunited. According to the poster, Chibiterasu likes the sun, painting, and peanut butter. (All dogs love peanut butter, so that last one was kind of a given.) If you call the number ... well, I'll just let you try it and find out for yourself.